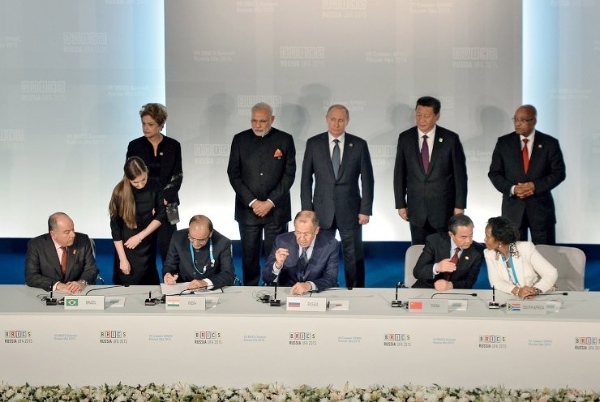 Leaders of BRICS countries, some of the world’s most important emerging economies, have adopted the Ufa declaration, the final resultant document of the summit on Thursday. Following marathon rounds of talks, the five emerging powers signed a raft of inter-governmental agreements and the Ufa Communique. The BRICS deliberations on the current global political and economic situation were reflected in the document. The BRICS bloc noted the fragile recovery of global growth and also said they were “concerned about potential spillover effects from the unconventional monetary policies of the advanced economies”. The United States refusal to ratify the IMF voting reforms remained a core concern, said the group. “We remain deeply disappointed with the prolonged failure by the United States to ratify the IMF 2010 reform package, which continues to undermine the credibility, legitimacy and effectiveness of the IMF,” said the document. BRICS accounted for over 17 percent of global trade, 13 percent of the global services market and 45 percent of the world’s agricultural output in 2014. The combined GDP (purchasing power parity) of the five BRICS countries surged from $10 trillion in 2001 to $32.5 trillion in 2014. The Ufa declaration also asserted that “the NDB (New Development Bank” shall serve as a powerful instrument for financing infrastructure investment and sustainable development projects in the BRICS and other developing countries and emerging market economies”. The BRICS Bank will approve its inaugural investment projects in the first quarter of 2016 and will work closely with the China-led AIIB. All the five BRICS countries are members of the AIIB. “We welcome the proposal for the NDB to cooperate closely with existing and new financing mechanisms including the Asian Infrastructure Investment Bank,” said the document. The Ufa declaration also makes references to the 70th anniversary of the defeat of Nazi Germany, “fascism” & “militarism” during World War II and denounces attempts to rewrite history but stops short of mentioning Japan. “We express our commitment to resolutely reject the continued attempts to misrepresent the results of World War II. While remembering the scourge of war, we highlight that it is our common duty to build a future of peace and development,” said the communiqué. China and Russia also said on Thursday they they support the UNSC aspirations of Brazil, South Africa and India. The BRICS leaders vowed to work close with the UN to uphold international treaties, while criticizing the adoption of “double standards”. “We emphasize the need for universal adherence to principles and rules of international law in their interrelation and integrity, discarding the resort to “double standards” and avoiding placing interests of some countries above others,” said the document. The BRICS countries have regularly criticized the interventionist foreign policy approach of Washington, including air strikes in Middle eastern countries, like Syria and Iraq. In major succor for Russian President Putin, his BRICS counterparts continued to rally behind Moscow by opposing the Western sanctions against Russia over the Ukraine conflict. “We condemn unilateral military interventions and economic sanctions in violation of international law and universally recognized norms of international relations. Bearing this in mind, we emphasize the unique importance of the indivisible nature of security, and that no State should strengthen its security at the expense of the security of others,” added the Ufa communiqué. The bloc continued its stance on the two-state theory for the Palestine-Israel conflict. The BRICS called for East Jerusalem to be established as the capital of the state of Palestine and an end to Israeli settlement building. “We oppose the continuous Israeli settlement activities in the Occupied Territories, which violate international law and seriously undermine peace efforts,” said the document. The Ufa communique also said the BRICS “strongly condemn human rights violations by all parties to the conflict” in Syria. The BRICS also adopted an “Action Plan” that maps the 2016 trajectory of the group. The Russia-proposed “Strategy of BRICS Economic Partnership”, a blueprint for the group’s trade, investment and commerce ties up to 2020. Among other things, it will be aimed at increasing the competitiveness of BRICS countries in the global economy. The five foreign ministries also signed an agreement on creating a joint BRICS website, which will act as a virtual secretariat of the group. The Central Banks of the five countries have also signed cooperation agreements with the New Development Bank. Great to see the unified commitment towards the strong economically growth of the World’s largest Emerging Power’s (BRICS). Short after the NSA scandal Mr. Kerry told 2013 in Brasilia, that Brasil “has to understand and accept”. Even after Dilma´s recent trip to Washington in early July2015, Brazil had still not the assurance that its politicians will no longer be spied.